The story of Jesus healing ten lepers, found in Luke 17, is a wonderful example of the many miracles Jesus performed and the importance of thanking God for his blessings. 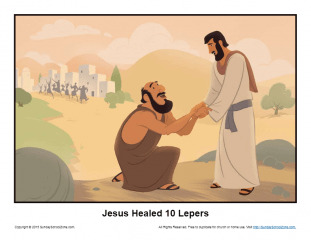 This story illustration shows one of the lepers coming back to thank Jesus for his miracle while the other nine go away. It can be used as part of a Bible teaching session or as part of a children’s sermon.